This glass painting illustrates the best-known episode in the Saint’s life when she received a flaming dart in her heart from an angel. The version in this panel is a variant of this event in which the flaming point is received from a vision of Christ, with a dove and two angels in clouds of glory above her. St Teresa kneels supported by an angel while a winged demon flees the scene. 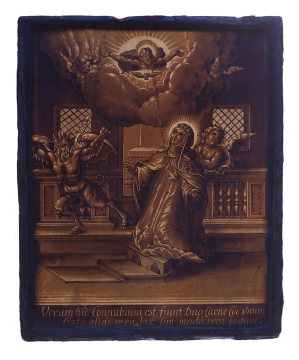 The glass painter has combined figures from two engravings in the series Vita S. Virginis Teresiae by Adriaen Collaert, printed in 1630 by Joannes Galle. The background and figures of St Teresa, the angel to her left, Christ and the Dove of the Holy Spirit in clouds supported by cherubs are borrowed from Plate 8. The demon is taken from Plate 7 and replaces the angels to and above St Teresa's right. The flaming point from Christ entering St Teresa's heart replaces the flaming arrow in Plate 8. The glass painter has also placed St Teresa on shallow steps and has the demon uttering VIDEO. The inscription accompanying the glass painting differs from those in Plates 7 and 8 and reads: Verum hic Connubium est, fiunt Duo Carne Cue vinum / Esto, alias mendax sum modo loquor. A complete version of Plate 7 is in the Chapel at Farleigh Hungerford Castle (Somerset) and was not catalogued by Cole. It shows St Teresa kneeling before a painting of Christ while devils flee from her. A flail and birch lie on the ground. One of a set comprising SG61, SG63, SG65, SG67, SG68, SG86, and SG110. SG91 shows another scene but is presented in a different format.